According to the latest predictions of the U.S. Centers for Disease Control and Prevention (CDC), if the Ebola pandemic continues to progress at the current rhythm, it could affect 1.4 million people in Liberia and Sierra Leone between now and January 2015, leading to the deaths of 700,000 in a year, and thus making Ebola the third leading cause of death from infectious diseases in Africa, after AIDS and respiratory diseases. The two countries most seriously affected could suffer the loss of 10 percent of their populations in a year, if one takes into account the impact of such a catastrophe on food production and the overall health of the populations involved. Our understanding of the causes then is urgent in order to avoid the worst and to prevent similar tragedies in other regions of the global South. 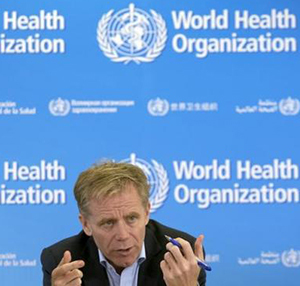 Bruce Aylward of the World Health Organization speaks at a press conference at the WHO headquarters. We should first note that this illness seems to have been controlled in Nigeria and in Senegal, and that it seems to have been slowed down in Guinea. The Democratic Republic of the Congo, where a similar epidemic began at the end of August also seems to have been brought under control, a country that has experience with this disease since 1976. How can we explain then the particular seriousness of the pandemic in Liberia, which has the majority of new cases since mid-August, followed in second place by Sierra Leone? The fact that Guinea has done better suggests that the epidemic began in the forested areas of the south, largely cut off from the northern economy based on bauxite mining, the world’s largest reserve. In fact the south looks toward Liberia and Sierra Leone, which offer it the closest seaports. To understand the gravity of the situation in Liberia, in Sierra Leone and in the south of Guinea, it’s necessary to look carefully at the particularities of this sub-region. I note here four characteristics that constitute an explosive cocktail. At the end of the 1980s, Liberia, Sierra Leone, and the south of Guinea were at the center of armed conflicts for the control of natural resources. After the reestablishment of relative peace in the early 2000s, there was a surge of foreign investments, accompanied by land-grabbing and the expropriation of the small farmers who had been weakened by war. The increasingly rapid destruction of the forests endangered many animal species and pushed their microbial parasites to search for new hosts at the margins of their traditional ecosystem. The collapse of the state institutions that had been established when these countries became independent led to the transfer of their tasks to outside and local non-governmental organizations, private companies, and even to Western powers. It is the combination and interaction of these four characteristics that has made these countries an ideal terrain for the diffusion of the Ebola virus. The civil wars that bloodied Liberia and Sierra Leone starting at the end of the 1980s had largely been carried on by groups—whether those in power or those in rebellion—struggling over the control of natural resources, in particular diamonds (which because of these circumstances came to be called blood diamonds) as well as lumber, with the complicity of large multinational corporations. Those wars were the cause of the death of some 200,000 people, not to mention the thousands of wounded, mutilated, raped women, orphaned children, and those displaced and turned into refugees. The vast forests where Liberia, Sierra Leone, and Guinea touch have been particularly ravaged by the battles in which the Guinean army confronted the Liberian forces, which were allied to the rebels of Sierra Leone. In addition, this remote area where the capitals of the three countries are found has continued to be the scene of repeated violence, almost to this day, either in the district of Kolahun (Lofa County) in Liberia, or in that of Guéckédou, Guinea. It is in the latter that the Ebola epidemic broke out in December 2013. Liberia and Sierra Leone recovered from their civil wars and attained a relative stability, supported by the diplomats and the special forces of Great Britain and the United States, whose action has been continued by United Nations peace-keeping missions there, so that by 2005 in Liberia and 2005-07 in Sierra Leone there had been put in place a semblance of representative democracy and business-as-usual resumed. The international index of “economic freedom” (of the Heritage Foundation and the Wall Street Journal) showed a continual improvement in commercial freedom, in the monetary and tax systems and in investments in the two countries, and only the rights of workers and public services have worsened. No doubt about it: the international competition for the control and exploitation of natural resources has returned with a vengeance, dispensing with the mediation of costly armed bands, as part of the new scramble for Africa. During the last five years, from 2009 to 2013, according to the World Bank, the GDP of Liberia has grown on average by 11.1 percent per year, and Sierra Leone by 10 percent. Overall, Guinea remains behind, with a growth rate of 2.5 percent, though it is true that is has not suffered a destructive conflict in the whole country. In Liberia and Sierra Leone rural communities have been the first victims of the war and of the savage exploitation of natural resources by the belligerent parties; half of the inhabitants have been internally displaced, while at the same time there has been an influx of refugees from neighboring states, as hundreds of thousands of small farmers have been permanently uprooted. It is in this context of mining and land-grabbing that have developed on a large scale over the last several years, with the delighted encouragement of the authorities, obsessed with the neoliberal ideology if not actually corrupted—that in 2012, the tax abatements conceded to the six largest corporations represented 59 percent of the Sierra Leone budget. 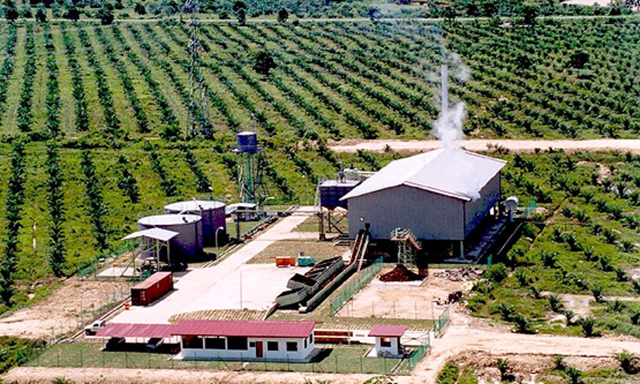 A Sime-Darby palm oil plantation; the company controls over 800,000 hectares of land. In Liberia, the grabbing up of arable land by international investors has exploded, notably by rubber and palm oil plantations and biofuels; and finally iron ore extraction has led to new concessions. This country now has the world record for foreign investment ratio to GDP. At the same time, 85 percent of its inhabitants live below the poverty line, and 80% of them are unemployed. Sierra Leone presents the same picture. In November 2011, the Swiss Addax Bioenergy Company of the billionaire Jean-Claude Gandur launched a great production unit aiming to develop 20,000 hectares of sugar cane, an ethanol refinery for export, and an electric power plant. Altogether, multinational corporations today control some 500,000 hectares of land in a single country. These investments deprive agriculture for food production of the land and water that it needs, which is why, echoing numerous popular protests, last June some 180 citizens signed the Freetown Declaration against land-grabbing. Forested areas of the three countries are subject to growing exploitation due to population pressure, aggravated by the influx of hundreds of thousands of refugees fleeing armed conflict. Meanwhile, the timber industry is sold to international dealers that open up roads and employ armies of lumberjacks. Small scale mining and the intensive exploitation of flora and fauna accompany these developments, so that the people whose livelihoods depend on all these activities must rely increasingly on bush-meat, hunted on a large scale, which is sold in regional markets for food. Throughout this sub-region, commercial lumbering has caused an irreversible destruction of the forest: while wooded areas represent only 4 percent of the surface of Sierra Leone, their importance in Liberia and the south of Guinea is much greater, representing a larger part of their territory. This is what led to the accelerated destruction of wildlife, which despite the animals’ higher morbidity, has not prevented them from also being hunted and consumed by people. This is probably also the reason why the fruit bats, healthy carriers of the Ebola virus, move on, traveling ever greater distances in search of food. It is therefore possible that it is these fruit bats, which originally came from their home in Central Africa, that brought the strain of the Ebola virus causing the outbreak in West Africa. Moreover, they often colonize the fruit trees that grow on the edges of the forests near inhabited areas. In 1991, Sierra Leone was subjected to a brutal structural adjustment program, reducing public spending by 40%, a development that contributed to the outbreak of civil war. Therefore, the state has increased its contracts with foreign private companies to provide public services, to be paid by a share of the profits from diamonds: the country acquired private troops, private customs agencies, a private central bank, and private fisheries, encouraging a growing complicity between African war lords and large international companies. Liberia has followed the same path, which led to the virtual disappearance of its already minimal medical infrastructure. Today, there are 1.4 doctors and 27.4 nurses per 100,000 inhabitants, compared to 2.2 and 16.6 for Sierra Leone (the OECD average is 320 and 890). With peace restored in the 2000s, similar processes have continued into the present. Now, it is “democratically elected” and internationally recognized officials who are selling off the natural resources of these countries to foreign investors. The latter are not required to accept national participation in these ventures, not even the smallest share; they are allowed to repatriate their profits; they are protected against any possible change in the law that would be unfavorable; they are exempt from taxes; and they have access to the workforce of the country at bargain prices. It must be said that the President of Liberia studied economics in the United States, and has worked for the World Bank, Citibank, and HSBC! There is still a “national” state, though it is primarily used for punishing people who dare to protest against those in power and their decisions. For instance, in dealing with Ebola, the authorities of the countries concerned have focused on military roadblocks, imposing quarantines to hundreds of thousands of people and stalking families who do not report their sick, to avoid their loved ones being taken away and isolated without getting any care. We find the same situation in the south of Guinea, where the poor Guéckédou District institutions have not been able to deal with the exponential growth of the population over the last 20 years, an explosion from less than 80,000 to approximately 350,000 people today. The infrastructure is so non-existent that when Doctors Without Borders (MSF) dispatched its first team in March 2014, they had to scramble to make a map of the city. In one day, from satellite images, 200 volunteers from around the world were asked to arrange some 100,000 homes in the metropolitan area on a plane that involved little more than two roads and the indication of some large areas inhabited. A feat that is nothing other than the mirror image of the total collapse of public services. The role played by MSF on this terrain is emblematic of the abnegation of responsibility by the United Nations organizations such as the World Health Organization (WHO). With an annual budget of $400 million, eighty percent of which comes from private donors, this corps of 35,000 volunteers has without a doubt been the principal actor in the struggle against the epidemic in West Africa since the spring of 2014. Overwhelmed by the breadth of the problem MSF has not hesitated to use its good will to call for massive civilian and military aid. With the exception of Cuba, which has announced that it will send 400 doctors and nurses and already has half of them on the ground, it is essentially the countries most engaged in the new partition of Africa that have responded to this appeal. China has converted a hospital in Freetown that it had previously constructed into a health care center and has sent the necessary medical personnel. The old colonial powers have made small gestures: France announced the establishment of a treatment center and a laboratory in Guinea, while the United Kingdom promised field hospitals in four urban zones of Sierra Leone. 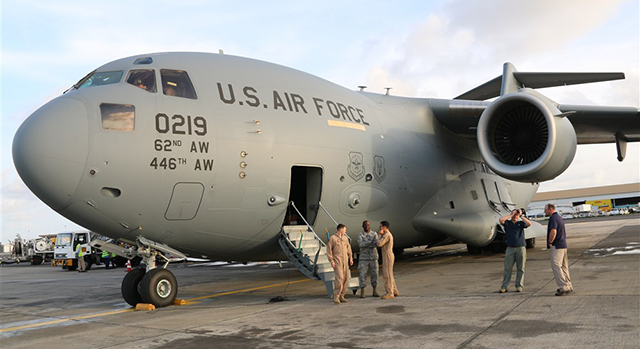 A U.S. Air Force shipment arrives in Liberia with military supplies. Obama struck a blow in deciding to send 3,000 troops to the countries most affected and by helping with the distribution of aid, together with the government of Senegal, with the local NGOs, but all by promising to establish 17 medical centers of 100 beds each. The headquarters of the operation is based in Monrovia, Liberia, under the orders of a U.S. AFRICOM general. After its intervention in Nigeria against Boko Haram, the U.S. Army has another occasion to polish its image on the continent, after having failed, despite its attempt to work with 49 African States, to establish AFRCIOM’s command center on the continent. A little more than a month earlier, the U.S. president had brought together 51 delegations from African countries for an unprecedented economic summit in Washington. “Strip away all the modern PR and prettified palaver and it’s an ugly scramble for oil, minerals, and markets for U.S. goods” noted the editor of Foreign Policy in Focus. If the devil had wanted to create an advertisement to sell capitalism to humanity, he would have presented the Swiss and their mountains of chocolate, though while buying it, humanity would have received Liberia, Sierra Leone, and Ebola as well. Indeed, the current epidemic is a condensation of the deadly consequences of a world order which feeds on the huge growth of inequalities: the exploitation without limits of men and of natural resources; the destruction of the environment; a double digit growth (for how long?) in profit to foreign investors and a handful of local potentates; states in the service of multinationals, which know nothing other than repression to deal with the discontent caused by their resort to privatization, supplemented by charitable NGOs, and in the case of a sharp crisis, by foreign armies aiming to make the situation permanent. Conspiracy theorists imagine that Ebola is the brainchild of a perverse scientist paid for by the imperialists’ military research funds, but fail to see that the real architects of death are the little circles of people who profit from the existing world order, and that they can only be dethroned by the action of a mass movement of people in struggle. In order to get out of this barbaric situation, we have to denounce the mystifications of those who unceasingly praise the “take-off” of Africa, portraying the multinationals as development agencies, that pass off the MSF as the WHO, and suggest that AFRICOM is the Salvation Army. At the same time, our solidarity should go to all of those African social movements that combat the pillage of their natural resources, the expropriation of their peasants, the super-exploitation of their workers, the ruin of their public services, and the repression of their democratic rights. Jean Batou is a member of the leadership of SolidaritéS–an anticapitalist, feminist and ecologist movement for 21st century socialism in Switzerland–and editor of their bimonthly solidaritéS. He is a professor of Contemporary International History at the University of Lausanne, Switzerland, and the author of numerous publications on the history of the globalization and social movements. This article was translated from the French by Dan La Botz, and the English translation was previously published on New Politics.